The best approach starts from the sizeable carpark at Dalrigh, from where bikes can be used on the track as far as NN 281 273. It is also possible to cycle from the lower station at Tyndrum. If on foot, there is a shorter approach from Glen Lochy, but there's a river and railway to negotiate, and it's less scenic than Glen Cononiish. South Gully is the most defined feature on the face, but as it terminates on the ridge some way below the summit, it doesn't see the attention it probably should. It's actually 2 gullies running in parallel, separated by a shallow rib. In ascent, the left hand line twists a little and is shorter; the right hand line is straighter and is the true line of the gully. The left hand line (in ascent) cuts to the left towards the ridge line at the top via a narrow gully. You are most likely to find a small bouldery cul-de-sac that requires a couple of metres scramble to get onto the ridge itself, although it's not improbable that enough snow would allow a complete snow covered ascent/descent. 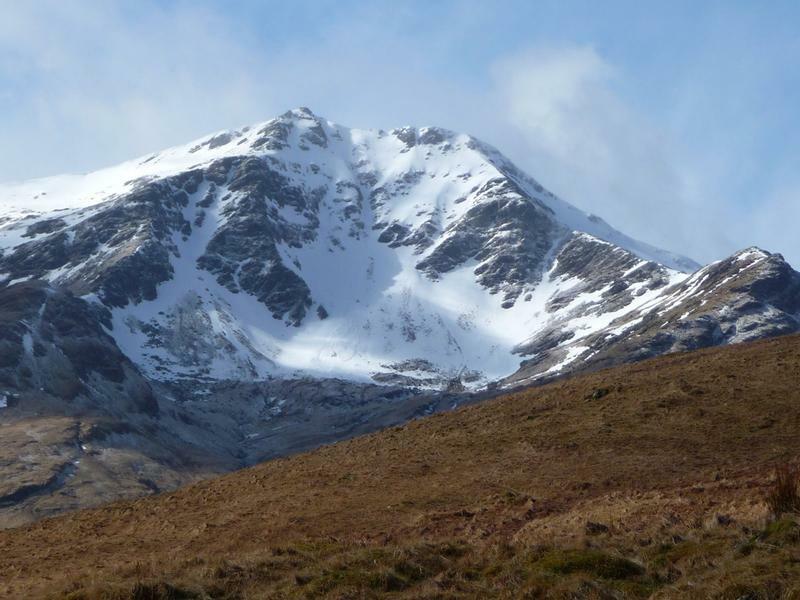 If this was the case, you would be able to ski off the summit of Ben Lui some way into Coire an t-Sneachda, and then into Coire Gaothach via this line. The right hand line (in ascent) goes higher up the ridge, and is the true line of South Gully. From below, it appears to end in a headwall, but there is a narrow gully on the right that may allow a way through and onto the ridge. I 've not been to the top of this line, so you will need to check it out yourself! I'd be interested to know if there is an exit onto the ridge above that allows a complete descent. The cornice can be problematic, but is usually avoidable directly below the summit or from some 50m (approx) towards the NW top (skier's left) at the lowest point between the two summits. Directly below the summit itself, the upper face provides exhilarating skiing above steep rocky ground before reaching the narrow confines of the gully which requires a number of tighter more technical turns on slightly steeper ground than above. The angle then eases as the gully opens out onto the broad lower slopes which give delightful skiing to the floor of the corrie or as far as the snow extends. When cornice conditions allow, it's possible to descend more or less anywhere from the summit ridge down the headwall of Coire Gaothach. This line descends from the East side of a rocky outcrop, straight down to a small rightward slanting chute into Central Gully about 100m down. trend right to join the exit of Central Gully. The former is the most logical when standing at the top, and provides a great descent. If the summit ridge is heavily corniced, then it is possible to traverse in a little way below, from the NNE ridge. To locate the top of the gully, stay to the skiers left of the ridge, but reasonable close to it, picking your way through the rocks if not all snowcovered. Be careful not to drop too far from the ridge into the corrie, as the gully you want to descend back into Coire Gaothaich could be easilly missed. The top of the gully is at a small col. Should you miss it, there is an easier descent beyond this back into the corrie, at another larger col below Stob Garbh. Descend the short, but reasonably narrow gully back into the corrie. 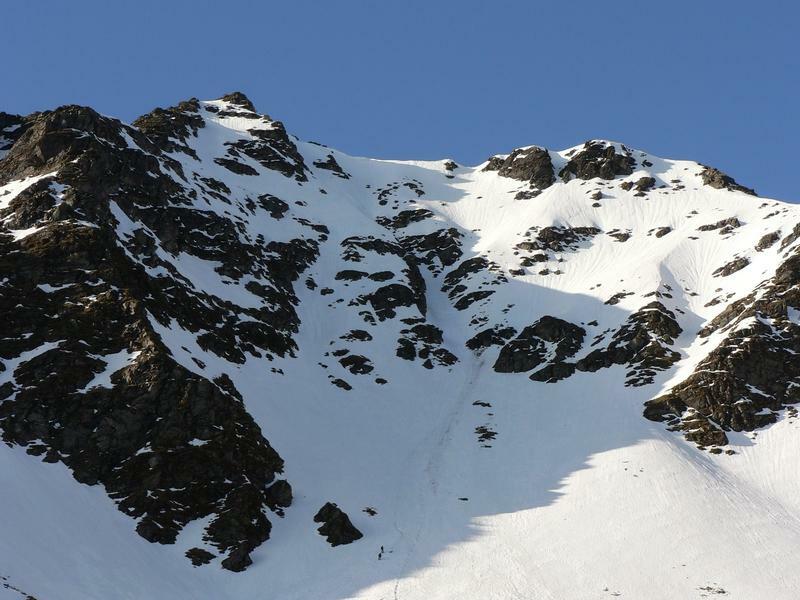 The gully is also known as "Cononish Couloir" in Scottish Offpiste Skiing & Boarding: Glencoe. You tube film of the gully.